Objectives To evaluate efficacy and safety of three different regimens of denosumab, a fully human monoclonal antibody to receptor activator of nuclear factor kappa B (RANK) ligand (RANKL), for Japanese patients with rheumatoid arthritis (RA). Methods In this multicentre, randomised, placebo-controlled phase II study, 350 Japanese patients with RA between 6 months and <5 years, stratified by glucocorticoid use and rheumatoid factor status, were randomly assigned to subcutaneous injections of placebo or denosumab 60 mg every 6 months (Q6M), every 3 months (Q3M) or every 2 months (Q2M). All patients basically continued methotrexate treatment and had a supplement of calcium and vitamin D throughout the study. The primary endpoint was change in the modified Sharp erosion score from baseline to 12 months. Results Denosumab significantly inhibited the progression of bone erosion at 12 months compared with the placebo, and the mean changes of the modified Sharp erosion score at 12 months from baseline were 0.99, 0.27 (compared with placebo, p=0.0082), 0.14 (p=0.0036) and 0.09 (p<0.0001) in the placebo, Q6M, Q3M and Q2M, respectively. Secondary endpoint analysis revealed that denosumab also significantly inhibited the increase of the modified total Sharp score compared with the placebo, with no obvious evidence of an effect on joint space narrowing for denosumab. As shown in previous studies, denosumab increased bone mineral density. No apparent difference was observed in the safety profiles of denosumab and placebo. Conclusions Addition of denosumab to methotrexate has potential as a new therapeutic option for patients with RA with risk factors of joint destruction. Denosumab is a fully human monoclonal antibody that binds specifically to human RANKL and inhibits bone resorption.7 This inhibition by denosumab is expected to inhibit the progression of bone erosion and bone loss. A phase II study of denosumab in patients with RA on methotrexate treatment was conducted in the USA and Canada.8 Denosumab 60 or 180 mg was administered to subjects every 6 months in this study. Denosumab inhibited the progression of bone erosions and systemic bone loss, compared with placebo. However, denosumab has not been studied extensively in Japanese patients with RA. Furthermore, the efficacy and safety of more frequent administration of denosumab had not been examined. Therefore, we conducted a clinical study including three different administration regimens of denosumab in Japanese patients with RA. This multicentre, randomised, double-blind, placebo-controlled, phase II study in Japan was conducted over 12 months. Japanese patients who had RA were randomised in a 1:1:1:1 ratio to receive one of four treatments, a placebo, denosumab 60 mg every 6 months (Q6M), denosumab 60 mg every 3 months (Q3M) or denosumab 60 mg every 2 months (Q2M). Randomisation was stratified by glucocorticoid use and rheumatoid factor (RF) status at baseline. Eligible patients were randomly assigned by a central registration method using a computer-generated randomisation list provided by an independent biostatistician. Treatment was masked to patients, investigators and sponsor until unblinding. All patients were subcutaneously administered placebo or denosumab at 0, 2, 3, 4, 6, 8, 9 and 10 months. All patients basically continued methotrexate treatment, and were given vitamin D ≥400 IU and calcium ≥600 mg per day throughout the study. The investigators could change the dosage of methotrexate within approved dosages in Japan (6–16 mg/week) and could use bucillamine, salazosulfapyridine, glucocorticoid and/or non-steroidal anti-inflammatory drugs at any time throughout the study. Eligible patients were outpatients who were diagnosed with RA based on the American College of Rheumatology (ACR) criteria.9 Main inclusion criteria were: disease duration of RA between 6 months and <5 years, 20–74 years old, use of methotrexate for at least 8 weeks prior to first investigational product (IP) administration and confirmed at least 6 swollen joints among 58 joints at the screening by investigator assessment. Enrolment also required the presence of bone erosion as assessed by the investigator on radiographs or meeting the following criteria at a screening: C-reactive protein (CRP) ≥1.0 mg/dL or erythrocyte sedimentation rate ≥28 mm/h and positive for anticyclic citrullinated peptide antibodies or RF>20 IU/mL. Main exclusion criteria were: classified RA functional status as class IV10 and previous or current treatment with any biologics for RA treatment. Bisphosphonate use and the use of oral glucocorticoid >10 mg/day (prednisolone equivalent) were prohibited throughout the study. Radiographs at baseline, 6 and 12 months were submitted to the central analysing centre (Synarc, California, USA). This centre evaluated radiographs by the van der Heijde-modified Sharp method.11 Clinical assessments recorded at baseline, 6 and 12 months included the following: physician's global assessment of disease activity by visual analogue scale (VAS), subject's assessment of pain by VAS and the Health Assessment Questionnaire Disability Index (HAQ-DI).12 Clinical assessments recorded at baseline, 3, 6 and 12 months included the following: patient's global assessment of disease activity by VAS, 66-joint count for swollen joints and 68-joint count for tender joints. Dual energy X-ray absorptiometry (DXA) scans of the lumbar spine (LS) and total hip (TH) were performed at baseline, 6 and 12 months. DXA instruments manufactured by Hologic or GE Healthcare were used. Quality control and analysis of bone mineral density (BMD) were performed by the centre (Synarc, Oregon, USA). All DXA machines were stable throughout the study. Serum and urine samples for evaluation of bone turnover markers (BTMs) and cartilage markers were collected at baseline, 1, 2, 3, 4, 6 and 12 months, which were analysed at a central laboratory (Mitsubishi Chemical Medience, Tokyo, Japan). Measured biomarkers were the following: (1) serum markers, including C-telopeptide of type I collagen (CTX-I), N-propeptide of type I collagen (PINP) and cartilage oligomeric matrix protein (COMP). (2) urine C-telopeptide of type II collagen (CTX-II). Patients had fasted for at least 10 h prior to the collections. The urine sample was collected from the second urine of the day. CTX-II was adjusted for creatinine (CTX-II/Cre). Blood and urine samples were obtained at baseline, 1, 2, 3, 4, 6, 7 and 12 months for haematology, blood biochemistry and urine tests. These were measured at the central laboratory. Anti-denosumab antibodies were assessed at baseline, 1, 6 and 12 months by PPD Development (Virginia, USA). Blood samples for pharmacokinetics were obtained prior to the IP dosing at baseline, 1, 2, 3, 4, 6, 7, 8, 9, 10 and 12 months. The serum concentrations of denosumab were measured by PPD Development. The primary endpoint was the change from the baseline in the modified Sharp erosion score at 12 months. Secondary endpoints included change from the baseline in the modified Sharp erosion score at 6 months, change from the baseline in the modified Sharp joint space narrowing (JSN) score and the modified total Sharp score (TSS) at 6 and 12 months and percent change from the baseline in BMD at the LS and TH at 6 and 12 months. Exploratory evaluations included the proportion of subjects with disease progression according to the erosion score, JSN score or TSS by the modified Sharp method, the proportion of patients achieving ACR20/50/70 response,13 change from the baseline in HAQ-DI, change from the baseline in the disease activity score 28 CRP (DAS28-CRP), percent changes from the baseline in BTMs and cartilage markers and percent change of BMD from the baseline in the subgroup of subjects with glucocorticoid use at baseline. 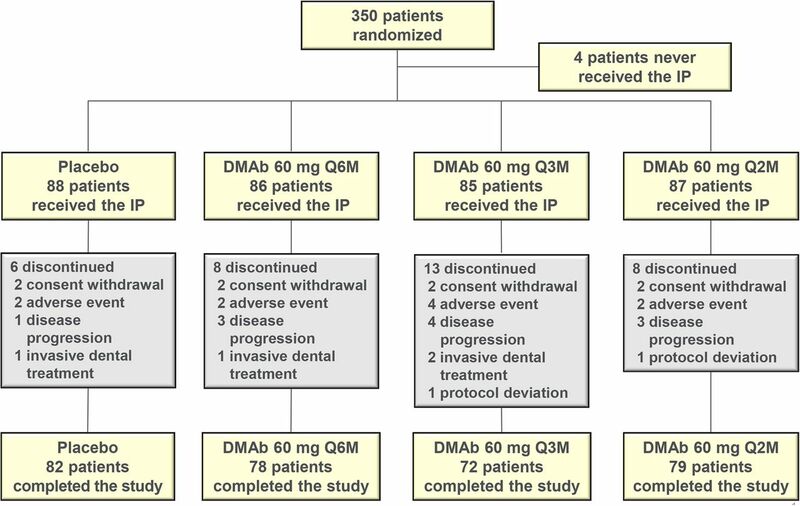 A sample size of 80 patients per group was calculated to have approximately 80% power to detect the dosing interval dependency and plateaued efficacy at denosumab Q3M for the primary endpoint. This calculation assumed that a difference between denosumab Q3M group and placebo group of −1.5, an SD of 3 and an early discontinuation rate of 10%. To control the family-wise type I error for multiple comparisons, comparisons between the denosumab groups and the placebo group were tested in a step-down manner using the Shirley–Williams test14 ,15 at a 0.025 one-sided significance level. The same analysis was conducted for the other endpoint of radiographic score change. In post-hoc analyses, comparisons among denosumab groups were conducted using the two-sided van Elteren stratified rank test adjusted for randomised strata. The proportions of patients with no disease progression (the radiographic score change from the baseline ≤0) and ACR20/50/70 were analysed using a Cochran–Mantel–Haenszel test adjusting for randomised strata. For changes from the baseline in DAS28-CRP and HAQ-DI and percent changes from the baseline in BMD, comparisons of each denosumab group with the placebo group were performed using the repeated measures model adjusted for the treatment, visit, baseline value, randomised strata and treatment-by-visit interaction. In post-hoc analyses, comparisons among denosumab groups for BMD percent changes from the baseline were conducted using the same repeated measures analysis. In the subgroup analysis, the BMD percent changes from the baseline were assessed by baseline glucocorticoid use (present/absent) using the same analysis. Comparisons of each denosumab group with the placebo group for percent changes from the baseline in BTMs, COMP and CTX-II/Cre by time point were analysed based on the two-sided van Elteren stratified rank test adjusted for randomised strata. Efficacy endpoints were analysed using a full analysis set (FAS), which included all randomised patients who received at least one dose of the IP and had a baseline and at least one postbaseline radiographic score. Missing values for the radiographic score were imputed using linear extrapolation/interpolation. For the other variables, no imputation was implemented. These imputation methods were used in the FAS. Pharmacokinetic parameters following 0 and 6 months doses, including area under the serum concentration–time curve up to the last quantifiable time (AUClast), maximum serum concentration (Cmax), time to reach Cmax (tmax) and observed cumulative coefficient (defined as the 6-month:0-month ratio of AUC during dosing interval), were calculated using a non-compartmental pharmacokinetic analysis method. The pharmacokinetic analysis was conducted using the FAS that had at least one serum denosumab concentration following administration of the IP. Patient disposition is shown in figure 1. Patient disposition. DMAb, denosumab; IP, investigational product; Q2M, every 2 months; Q3M, every 3 months; Q6M, every 6 months. Baseline demographics and characteristics were generally comparable between the treatment groups (table 1). However, the placebo group included slightly more females, patients aged ≥65 years and concomitant osteoporosis compared with the other groups. The osteoporosis was diagnosed by the investigators at each site. The changes from the baseline in the modified Sharp erosion score at 12 months as the primary endpoint were significantly lower in the denosumab groups than in the placebo group (figure 2A). The mean changes at 12 months from baseline were 0.99 (95% CI 0.42 to 1.56), 0.27 (0.06 to 0.48, compared with placebo, p=0.0082), 0.14 (0.02 to 0.26, p=0.0036) and 0.09 (−0.24 to 0.41, p<0.0001) in the placebo, Q6M, Q3M and Q2M, respectively. Changes from the baseline in the modified Sharp erosion score at 6 months were also significantly lower in the denosumab groups than that in the placebo group (p=0.0169, 0.0026 and <0.0001, respectively). The changes from the baseline in the modified Sharp JSN score at 6 and 12 months showed no significant difference between the denosumab groups and placebo group (figure 2B). The changes from the baseline in the modified TSS at 12 months were significantly lower in the denosumab groups than in the placebo group (p=0.0185, 0.0046 and 0.0001, respectively; figure 2C). At 6 months, only the Q2M group showed a significantly lower result compared with the placebo group (p=0.0054). Cumulative probability plots for changes in the modified Sharp erosion score, modified Sharp JSN score and modified TSS at 12 months are shown in figure 3. Proportions of the patients with no disease progression in the modified Sharp erosion score at 12 months were 62.5% (55/88), 78.8% (67/85, compared with placebo, p=0.0173), 80.5% (66/82, p=0.0099) and 83.5% (71/85, p=0.0019), respectively. Mean changes from the baseline at 12 months in the radiographic score by the van der Heijde-modified Sharp method. (A) Modified Sharp erosion score. (B) Modified Sharp joint space narrowing score. (C) Modified total Sharp score. N=number of patients who received ≥1 dose of investigational product and had a baseline and at least 1 postbaseline measurement of the radiograph score. Mean (95% CI). Missing values were imputed using linear extrapolation/interpolation. *p<0.025 vs placebo, Shirley–Williams test with α=0.025 one-sided versus placebo. (B) Because the change in score of the highest dose group of Q2M was not statistically significant, following statistical comparisons were not performed. (C) Because the change in score of Q3M was not statistically significant, statistical comparison at 6 months between placebo and Q6M was not performed. Q2M, every 2 months; Q3M, every 3 months; Q6M, every 6 months. Cumulative probability plots of changes from the baseline at 12 months. (A) Modified Sharp erosion score. (B) Modified Sharp joint space narrowing score. (C) Modified total Sharp score. N=number of patients who received ≥1 dose of investigational product and had a baseline and at least 1 postbaseline measurement of the radiograph score. Q2M, every 2 months; Q3M, every 3 months; Q6M, every 6 months. In ACR20/50/70 response rates, denosumab showed no statistical differences compared with the placebo except for the ACR20 response at 12 months in Q2M (p=0.0473) and the ACR20 response at 6 months in both Q3M (p=0.0047) and Q2M (p=0.0198; see online supplementary figure S1). No significant differences in DAS28-CRP and HAQ-DI were confirmed between the denosumab and placebo groups (see online supplementary figure S2 and S3). All denosumab groups significantly increased BMD at the LS and TH compared with the placebo group at 6 and 12 months (p<0.0001 for each group; figure 4A,B). Denosumab groups also significantly increased BMD at both sites compared with the placebo group regardless of glucocorticoid use (p<0.0001 for each subgroup; see online supplementary table S1 and S2). Percent change of BMD from the baseline. (A) Lumbar spine and (B) total hip. N=number of patients who received ≥1 dose of investigational product and had a baseline and at least 1 post-baseline measurement. *p<0.0001 vs placebo, based on repeated measures model adjusting for treatment, visit, baseline value, randomised strata (4 strata from the combination of baseline use of glucocorticoid and baseline rheumatoid factor) and treatment-by-visit interaction. Least square mean (95% CI). BMD, bone mineral density; Q2M, every 2 months; Q3M, every 3 months; Q6M, every 6 months. Denosumab significantly decreased the concentration of CTX-I and PINP compared with placebo at all-time points (p<0.0001 for each group; see online supplementary figure S4 and S5). The percent change of the COMP from the baseline in the denosumab groups showed the same tendency as that in the placebo group (see online supplementary figure S6). On the other hand, denosumab significantly decreased CTX-II/Cre concentrations from the baseline at 1 month relative to placebo (p<0.0001 for each group; see online supplementary figure S7). Patient incidence of adverse events was generally comparable among treatment groups (table 2). No cases of atypical femoral fracture (AFF) or osteonecrosis of the jaw were reported. One asymptomatic mild serum calcium decrease was reported in Q3M as an adverse event. No trends were noted in blood and urine tests, other than decreases in serum albumin-adjusted calcium, phosphorus and total alkaline phosphatase in denosumab groups. Average values of serum albumin-adjusted calcium at 6 and 12 months in Q6M returned toward the baseline level. While the calcium level in Q2M and Q3M tended to recover toward the baseline, a low level was sustained at 6 and 12 months. All mean and median values in albumin-adjusted calcium were within the normal range (data not shown). No antibodies against denosumab were detected. In Q6M, trough serum denosumab concentrations reached below the lower limit of quantification in many subjects (see online supplementary figure S8). 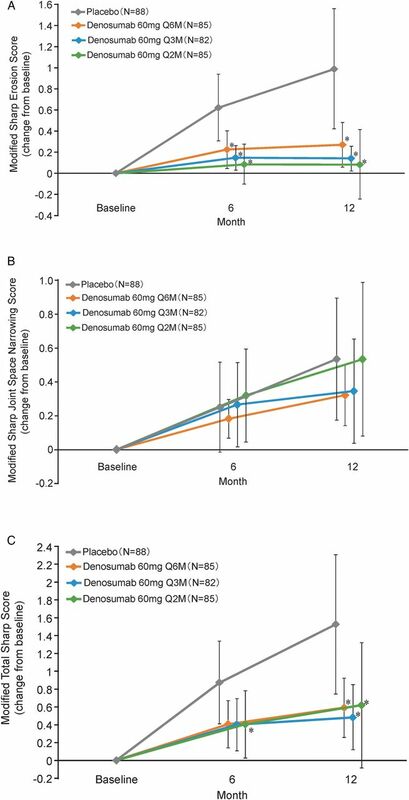 Both Q3M and Q2M achieved a steady-state plasma level of denosumab within 6 months. Based on AUC, no accumulation was observed in Q6M (see online supplementary table S3), whereas approximately 1.3-fold and 1.7-fold accumulations were observed at a steady state (6 months) in Q3M and Q2M, respectively. AUClast at a steady state were generally comparable across all denosumab groups. Denosumab significantly inhibited the increase in the modified Sharp erosion score compared with the placebo. While direct comparison between our study and the previous study8 is difficult because the patients’ backgrounds are different (such as mean RA duration is about 2 and 11 years, respectively), both of these studies showed that denosumab inhibited the bone destruction. Shorter dosing interval regimens of denosumab showed a numerical trend for better inhibition of bone destruction, while significant differences among denosumab groups were not confirmed. However, the trial was not powered to detect differences between doses. The proportion of the patients with no increase of the modified Sharp erosion score also increased with shorter dosing intervals. These small differences among denosumab groups may expand in longer-term observation. The mean trough concentration of denosumab increased with shorter dosing regimens. These results may indicate that higher trough concentrations of denosumab result in less progression of bone erosion. Denosumab groups showed no significant difference compared with the placebo group in almost all parameters of disease activity. Also, no significant difference was observed in any component of ACR response between the denosumab groups and the placebo group (see online supplementary table S4–S9). These results indicate that denosumab may have no effect on RA disease activity. These results were consistent with a previous RA study.8 The decreasing trend of DAS28-CRP was observed in all groups. The change of amount of methotrexate from baseline to 12 months was small, and the percentage of other added disease-modifying antirheumatic drugs (DMARDs) to methotrexate or increasing the amount of DMARDs was also small (data not shown). While patients took the methotrexate for at least 8 weeks from PI administration, this duration may not be long enough to achieve the maximum effect at baseline. Therefore, continuous background treatment together with better compliance during the RCT might contribute to the DAS28-CRP decrease. No significant difference in HAQ-DI was observed between the denosumab groups and placebo group. Joint destruction assessed by modified TSS is related to functional disability, which was confirmed in long-term observations.16 However, this relationship is weak in the short term. Our study was limited to 12 months. Therefore, detecting the difference in HAQ-DI was considered difficult. However, all denosumab groups showed a significantly inhibited increase of the modified TSS at 12 months compared with the placebo group. Therefore, denosumab is considered to have a potential to contribute to maintaining physical function with long-term treatment. BMD increased significantly at all sites in all denosumab groups compared with the placebo group. While there was no significant difference among denosumab groups in BMD change at the TH, significant differences in BMD change at the LS were confirmed between Q2M and Q6M and between Q2M and Q3M at 6 months (p=0.0063 and 0.0276, respectively) and 12 months (p=0.0004 and 0.0477, respectively). These results indicate that changes in BMD may be easier to detect in areas rich in trabecular bone than areas richer in cortical bone. Denosumab increased BMD in patients with RA regardless of glucocorticoid use. Thus, denosumab is expected to be a therapeutic option for preventing bone loss in patients with RA regardless of glucocorticoid treatment. Trend of the BTMs change is consistent with previous studies.17 ,18 Result of COMP seems to be consistent with the result of the modified Sharp JSN score change. However, CTX-II/Cre was suppressed in the denosumab groups compared with the placebo group. Non-clinical data suggest that osteoclasts relate to the progression of bone erosion in the subchondral bone and destruction of the mineralised cartilage.19–21 Therefore, our results raise the possibility that prevention of this destruction by denosumab may lead to secondary inhibition of cartilage destruction. However, this study showed some discrepancies. Also, CTX-II is usually used as a cartilage marker, while it sometimes is regarded as a BTM.22 ,23 Thus, additional research on the cartilage markers may be needed. 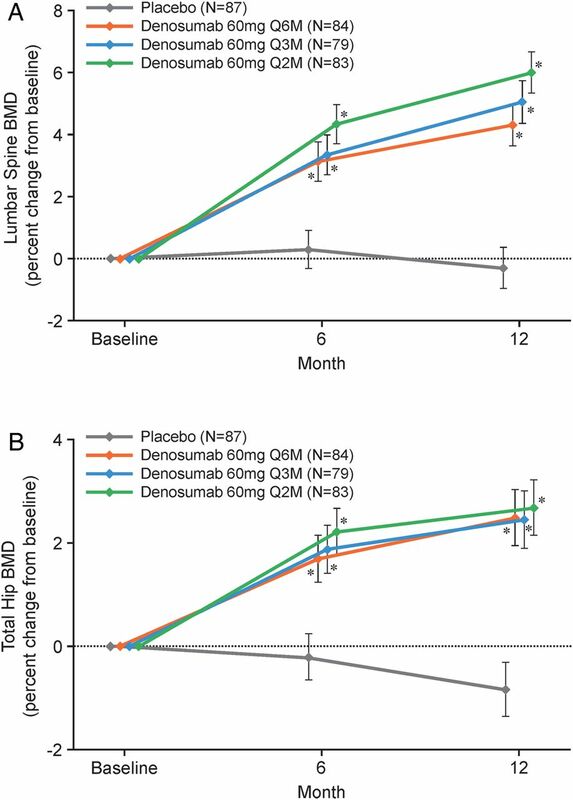 Twelve months of treatment with denosumab was well tolerated in Japanese patients with RA. The safety profiles of denosumab groups were generally comparable with the placebo group and consistent with previous studies.8 ,17 ,18 ,24 While AFF was not reported, both the Q3M and Q2M groups maintained the chronic decrease of BTMs. We may need longer term observation to confirm it. Insufficient inhibition of structural joint damage by DMARDs was reported despite clinical improvement.25–27 Some patients with an inadequate response to DMARDs are treated with biologics. However, many of these patients cannot move to biologic therapy for a variety of reasons. Our study indicates that addition of denosumab to background methotrexate treatment has potential to be a new therapeutic option for prevention of joint damage in patients with RA with risk factors of joint destruction. Limitations of this study include the relatively short duration of the treatment and the relatively small number of patients. Also, this study was not designed completely based on the ‘treat to target’ principle28 because the objectives of this study are to evaluate efficacy and safety of denosumab in patients with RA. In conclusion, our study demonstrated that denosumab inhibited the progression of bone erosion, increased BMDs and was generally well tolerated in Japanese patients with RA on methotrexate. Addition of denosumab to background methotrexate treatment has potential to be a new therapeutic option for patients with RA with risk factors for joint destruction. The authors would like to thank the patients who were involved in this study and the investigators. The authors also acknowledge the assistance of Amgen for editorial assistance on the manuscript. Contributors All authors met the following criteria for authorship: TT, YT, NI and HY provided substantial contributions to the study conception and design. TY diagnosed the oral adverse events. TO was involved in the design of the study, conduct and collecting the data. NO was involved in the design of the study and the analysis of data. DH was involved in acquisition of data (radiographs). All authors interpreted the data. All authors discussed and agreed on the content of the manuscript before submission. Funding This study was funded by Daiichi-Sankyo Co., Ltd. Sponsors were involved in the study conception, design, conduct, data collection and data analysis. Competing interests TT has received consulting fees and/or research grants from Astellas, BMS, Celtrion, Chugai, Daiichi-Sankyo, Eisai, Mitsubishi Tanabe, Nipponkayaku, Pfizer, Sanofi-Aventis, Santen, Takeda, Teijin Pharma, AbbVie, Asahi Kasei Pharma, Taisho Toyama, Janssen, Astra Zeneca, Eli-Lilly Japan, and Novartis. YT has received consulting fees and/or research grants from Abbvie, Chugai, Astellas, Takeda, Santen, Mitsubishi-Tanabe, Pfizer, Janssen, Eisai, Daiichi-Sankyo, UCB, GSK, BMS, MSD, and Novartis. NI has received consulting fees and/or research grants from Takeda, Mitsubishi Tanabe, Astellas, Chugai, Abott Japan, BMS, Eisai, Janssen, Kaken, Pfizer Japan, Taisho Toyama, Otsuka, and Daiichi-Sankyo. HY has received consulting fees and/or research grants from AbbVie, Asahikasei Pharma, Astellas, BMS, Chugai, Daiichi-Sankyo, Eisai, GSK, Janssen, Mitsubishi-Tanabe, MSD, Nippon Kayaku, Pfizer, Santen, Taisho-Toyama, Takeda, and Teijin Pharma. TY has received a consulting fee from Daiichi-Sankyo. TO and NO are employees of Daiichi-Sankyo and NO has shares of stock. HKG has received consultation fees from Daiichi-Sanyo, Pfizer, Amgen, Bioclinica, Eli-Lilly, Janssen, Servier, Novartis, Takeda, and Merck. DH has received consulting fees and/or research grants from AbbVie, Amgen, AstraZeneca, Augurex, BMS, Celgene, Centocor, Daiichi-Sankyo, Eli-Lilly, GSK, Janssen Biologics, Merck, Novartis, Novo-Nordisk, Otsuka, Pfizer, Roche, Sanofi-Aventis, Schering-Plough, UCB, and Vertex. Director of Imaging Rheumatology BV. Ethics approval This study was approved by the institutional review board at each participating site and was conducted in accordance with the principles of the Declaration of Helsinki. Data sharing statement Several abstracts have been presented at ACR; however, this is the first manuscript.